This semester, both Welcome Day and Club Day were held on Feb.11 and added up to a day full of excitement. Clubs set up their areas with decorations, games and music hoping to attract students who shared common interest. Staff set up individual tables filled with information for several different departments. The tables were filled with complimentary treats and souvenirs that also attracted students. Many vendors also set up shop in front of the library, drawing students’ attention with their displays and collections. There were a variety of vendors, which sold everything from clothing to antique artifacts that had been hand carved to hand-made ethnic jewelry and accessories. Nelson also expressed how students feel more comfortable getting involved when they see a group of students who like the same thing. As an ECE major, Nelson expressed her excitement for Club Day and Welcome Day as an “update of information” in regards to new programs and classes available. Nelson mentioned how students are often so busy with classwork and assignments that they don’t take the time to see a counselor to get informed on new activities or opportunities taking place. Vendors like Antonio Rubio also saw that Club Day and Welcome Day brought in a lot of profit. Performers and games that were hosted by different clubs attracted crowds as well. “The displays are outstanding,” said Rubio. This was Rubio’s first time at the ARC Welcome and Club Day event, and he was surprised at how much business he received and does plan to attend future events. “It was a better turnout than I thought,” said Rubio. Mary Wolf was one of many faculty members enjoying the Club Day. She sat behind her table, which displayed all the current programs the career technical education programs offer. “For students to feel like they are a part of their college is essential to their academic success,” Wolf said. Club Day and Welcome Day were definitely events to get students involved. Wolf mentioned “diversity among staff and students” as one of many factors that make events such as Club Day and other events possible. 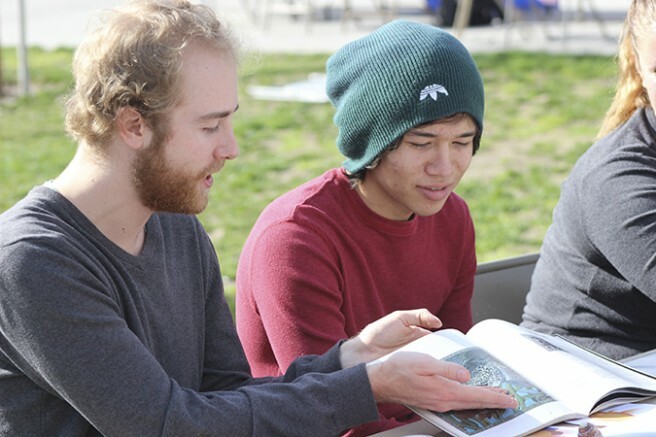 These opportunities for students to come together and explore common interests bring together our college community. Ashley Davis is a first-semester student on the Current, where she serves as a staff member. She plans to get her AA and transfer to study journalism and mass communication. Be the first to comment on "School spirit is in the air with Club Day"